Experienced email marketers often operate under the misconception that the CAN-SPAM Act doesn't apply to most routine business communications. With CAN-SPAM Act fines of up to $16,000 per violation, this misconception could add up to a big number. That's why email marketers should avoid 3 gotcha's that are CAN-SPAM traps for the unwary. The CAN-SPAM Act of 2003 (CAN-SPAM) promised to provide remedies against annoying and unsolicited bulk email known as “spam”. 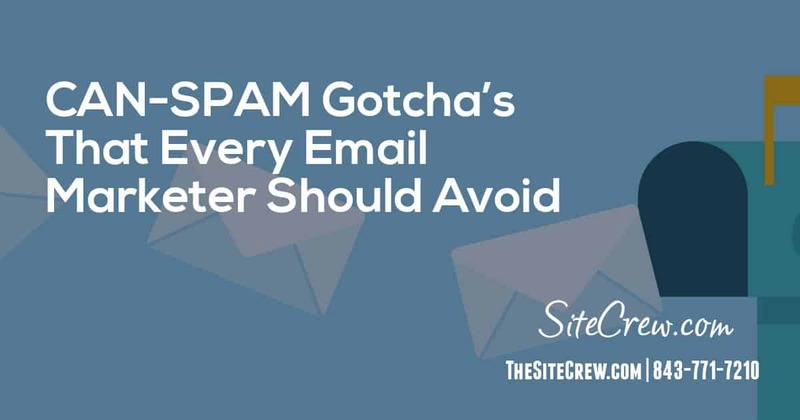 Typical of legislation that starts out with limited objectives, CAN SPAM reaches much further than regulating unsolicited, bulk email – and that's where the gotcha's come into play. * contents: the email must (i) clearly and conspicuously indentify that it is an ad, (ii) provide clear and conspicuous notice the recipient may unsubscribe for additional emails, and (iii) contain a valid postal address for the sender (may include a valid post office or private mailbox address). In addition to supplementing the 5 basic rules, CAN-SPAM's 2008 amendments added an additional rule regarding email newsletters and other emails that have multiple advertisers, contributors, or senders. Under the new “designated sender” rule, multiple contributors to the email may designate as single sender who must be designated in the From line, and who will be responsible for CAN-SPAM compliance. “Commercial” emails are required to comply with all 5 of the basic rules, plus the “designated sender” rule. “Transactional or relationship message” emails are required to comply only with the header information requirement and the “designated sender” rule. Gotcha 1 – CAN-SPAM Applies Only to Bulk Email, Right? Although much of the publicity surrounding the passage of CAN-SPAM focused on regulation of unsolicited, bulk email, there is no minimum number of emails for CAN-SPAM to apply; CAN-SPAM applies to even a single email. So, if a single email relates to the business of an individual or entity, it's a “commercial” email and CAN-SPAM applies, and the email is subject to all 5 of the basic rules, plus the “designated sender” rule. Gotcha 2 – CAN-SPAM Only Applies to Unsolicited Email, Right? The Federal Trade Commission (FTC) made it clear that CAN-SPAM may apply to emails that are solicited. The FTC stated in regulations issued in 2008 that the FTC would view email newsletters that were subscribed to (or solicited by) a person to fall within the definition of a “transactional or relationship message” if the newsletter consists exclusively of informational content or combines informational and commercial content. So, even if the email newsletter is solicited by the recipient, CAN-SPAM applies; however, as discussed above, as a “transactional” email, the sender is required to comply only with the header information requirement and the “designated sender” rule. Gotcha 3 – Regular “Business-to Business” Emails are Not Covered by CAN-SPAM, Right? The FTC made it clear in 2008 that emails sent in connection with what most businesses view as “business-to-business” relationship emails may also be regulated as “commercial” emails under CAN-SPAM. For example, the FTC noted that “business-to-business relationship” emails could include mortgage lenders sending emails to brokers with the latest interest rate information or equipment leasing businesses sending emails to equipment vendors regarding rate sheets. The FTC expressly rejected a request by business leaders to add a “business-to-business relationship message” category to the “transactional or relationship message” category discussed above. This means that “business-to-business relationship” emails are subject to all 5 of the basic rules, plus the “designated sender” rule. So, even though this determination by the FTC regarding “business-to-business relationship” emails flies in the face of reason and common business practices, it's the law according to the FTC. With CAN-SPAM, as with many statutes, there are unintended consequences that sometimes lead to surprising results. Nevertheless, strict compliance with the rules involving the 3 gotcha's is required in order to avoid liability under CAN-SPAM. Leading Internet attorney Chip Cooper has automated the process of drafting DigiContracts.com Website Legal Forms for website legal compliance. Use his free online tool — Website Documents Determinator — to determine which documents your website really needs for website legal compliance. Discover how quick, easy, and cost-effective it is to draft your website legal forms at DigiContracts.com.